3235 km ridden at an average speed of 30.59 km/hr. During stage seven, Antonio Pesenti unleashed a devastating attack and took the lead, which he held to the end. Pesenti's teammate and four-time Giro winner Alfredo Binda did not come to the Giro in good form and instead worked for Pesenti's victory. Apologies for the incomplete listing of ascents. Thirty-nine year old Costante Girardengo was at the start line along with Guerra, Binda, Mara, Giacobbe, Camusso, Piemontesi, Di Paco and the man who had taken third in the 1931 Tour, Antonio Pesenti. Transalpine riders had grown in number and quality. Magne returned along with Giro newcomers Joseph Demuysère (second in the ’31 Tour with two stage wins), Kurt Stöpel (he would be second in the ’32 Tour), Julien Vervaecke (first in the ’32 Paris–Roubaix, third in the ’27 Tour) and Raymond Louviot (future champion of France). Girardengo wasn’t the only old veteran looking for another shot at racing glory. Giovanni Gerbi, the old Red Devil, entered as an independent at the age of 47. In a cloud of dust, 83 of the 109 starters roared into Vicenza to contest the first stage. Like the year before, Guerra was the Giro’s first maglia rosa. But right with the speeding locomotive was Girardengo, apparently not quite past his sell date. And close by, even though they were several bike lengths back, showing what the era called “at same time”, were Ettore Meini and Kurt Stöpel. Further back, lost in the obscuring dusty haze were Binda and Mara. And the Red Devil? He finished the first stage outside the time limit at 59 minutes 10 seconds. He decided to continue racing all the way back to Milan even though he was no longer a classified rider. The 1932 Giro continued to surprise. German Herman Buse soloed in to Udine more than eleven minutes in front of Frenchman Raymond Louviot and Italian (Swiss if you ask a person from Switzerland) Alfredo Bovet, winner of that year’s Milan–San Remo. When the big men of the peloton were inattentive, the German saw his chance and lost no time in scuttling away. The tifosi were furious. They felt the Italians were sandbagging the race. As far as the Italian fans were concerned, Buse, a German for gosh sakes, was getting a free ride. Always looking for ways to make the racers popular, the press chose to nickname Pesenti “Il Gatto di Zogno” (the Cat of Zogno, Zogno being Pesenti’s hometown). Learco Guerra wins stage nine in Rome. Guerra was not a man to give up, and his stage win in Naples brought him up to fourth place, but still a distant sixteen minutes behind the leader Pesenti. In the winning break with Guerra were Mara (called l’Aquilotto or “Eaglet” by the press), the ever attentive Demuysère and Remo Bertoni. Demuysère was now second and Bertoni third. 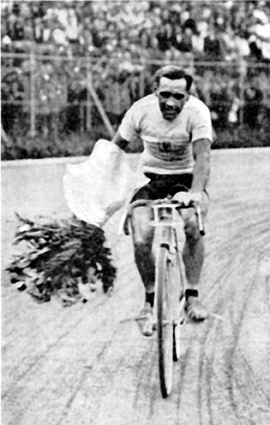 The remarkable Guerra went on to win two more stages including the prestigious final stage into Milan. That made Guerra the winner of six out of the year’s thirteen stages. Stage 10, the pack climbs to Radicofani in tuscany. By 1932 Guerra had become the sought-after anti-Binda, but nothing could shake Pesenti’s lead. The five-minute gap he carved out of the seventh stage grew to over eleven at the end of the race. Clearly, he was the race’s finest rider. La Gazzetta thought Pesenti an inelegant pedaler, but given his admitted superiority, gave him a pass on his lack of cycling style. That final stage finish brought another advance. For the first time a Giro d’Italia race finish was broadcast live over the radio. Binda didn’t bring his usual tremendous form to the 1932 Giro, choosing instead to make a virtue out of necessity and manage the Legnano team’s effort to deliver Pesenti to Milan in pink. From that point of view, his Giro was a success. Moreover, La Gazzetta noted that Pesenti had both the Wolsit and Legnano teams riding on his side, which meant both Binda and Bertoni were working for him. That made an impregnable wall of strength against which teams like Ganna (Demuysère), Maino (Guerra and Giacobbe) and the others could do little. After Binda won his third World Championship in Rome in August of that year with compatriot Bertoni second, he could call his season a success as well. Magne went home empty-handed again with a 34th place, nearly two hours down. With no notable victories, 1932 clearly wasn’t Magne’s year. But while he would never again try to win the Giro, he would go on to a second Tour win in 1934 and a World Championship in 1935. The 1932 Giro was raced at an average speed of 30.594 kilometers per hour, the first edition to crack 30 kilometers per hour. Gerbi died in a car accident in 1955 while returning from a visit with his old adversary, Giovanni Rossignoli. Until 1932, Buysse’s and Alavoine’s third places in the 1919 and 1920 Giri were the only times foreigners had made it to the final podium. Demuysère’s second place as well as Stöpel’s fifth showed the rising international quality of the Giro peloton.